Adobe Lightroom is a photo editor and organiser. It offers a complete set of features that will help your photography workflow now and well into the future. Post-processing is an inevitable and necessary part of digital photography. Many people don’t want to spend lots of time editing and instead prefer to spend their time behind the camera, taking photos. However, taking a few minutes to organise your images after a photoshoot will allow you to get the very best from your hobby. If a photo is worth editing, you should be able to do this in a few minutes – otherwise, it’s probably not worth editing. It’s pretty easy to amass thousands of photos on your computer in a short space of time. And you’ll usually end up with them all over the place, making it near impossible to find a specific image. People often have duplicate photos too, that take up more space on your hard drive. I’ve met many people that have Adobe Lightroom on their computer but” haven’t got around to figuring it out yet”. Instead, they continue to use Photoshop to edit their shots simply because that’s what they have always used. But using Adobe Photoshop to edit your images is like using a sledgehammer to crack open a nut. Photoshop offers no management workflow either. This Lightroom Workflow and Editing workshop is perfect for anyone who would like to learn how to use Lightroom as your complete workflow solution. It will give you a great basis on how to manage and edit your images to get the very best from your RAW files. This is the workflow I use myself. I will simplify the Lightroom interface for you and show how you can quickly work your way through a small or large number of images to get the very best ones from your photoshoot. How to use Lightroom as a complete workflow solution. 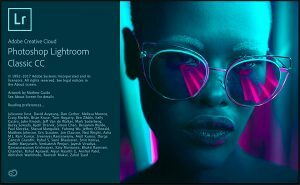 Overview of the display, interface and controls of Lightroom. How to make a Lightroom Catalog. Create a simple folder structure to better manage your photos. Importing and converting RAW files into a Lightroom catalogue. How to quickly cull files down to the ones you want to edit. Using the Develop Module to bring out the very best from your RAW files. Colour correction, cropping, cloning, sharpening, keywording, exporting. How to watermark your photos. Using collections to better manage your photos. Synchronising edits across multiple photos to greatly speed up your workflow. Using Lightroom presets and how to create your own. Why you should shoot in RAW. Develop your own personal editing style. Anyone attending must have their own laptop/desktop with Adobe Lightroom already installed. If you don’t yet have Lightroom, you can “Click Here” to download a trial copy. This course is suitable for both Windows and Mac users. Booking or Interest: contact John here.